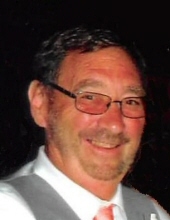 Gregory A. Strean, age 66, of Van Dyne, passed away on Wednesday, April 3, 2019, after a four year courageous battle with cancer. Throughout his battle Greg always remained positive and in good spirits. He was born on August 27, 1952, in Waupun, the son of Robert Strean and Gertrude (Serwe) Strean Polzin. On July 30, 2005, Greg married Julie Schumacher in Fond du Lac. Greg worked at Fountain Circle, Fond du Lac Bumper Exchange, and over thirty-five years at Mercury Marine. Greg loved the outdoors including camping, bonfires and four-wheeling. All of these activities always included a bottle of Greg’s homemade Apple Pie to share with his family and friends. He also enjoyed playing pool, bow hunting, rock collecting and coin collecting. Greg could often be found playing with and antagonizing his cats, whom he loved dearly. Survivors include his wife, Julie of Van Dyne; his children, Heather (Sean) Ducoty of Oshkosh, Holly (David) Bohn of Appleton, Heidi (Ryan) Errard of Wheaton, IL, Bradley (Kaitlyn) Teichmiller of Fond du Lac; six grandchildren, Emma, Ethan, Brynn, Audrina, Norah, and Bennett; his siblings, Claude Strean of Fond du Lac, Deborah (Joe) Dion of Ripon, Tim (Kathy) Strean of Fond du Lac, Daniel (Laurie) Strean of Fond du Lac, Todd Strean of Utah; brothers-in-law and sisters-in-law, Jan (Bonnie) Schumacher of Fond du Lac, Gayle Schumacher of Horicon, Brian (Carla) Schumacher of Fond du Lac, Chris (Sharon) Schumacher of Van Dyne, Scott (Roseanne) Schumacher of Mt. Calvary; his mother-in-law, Gloria Schumacher of North Fond du Lac; and many nieces, nephews, and other relatives and friends. He was preceded in death by his parents; his step-father, Bill Polzin; his father-in-law, Donald Schumacher and sister-in-law, Nancy Strean. Visitation will take place on Tuesday, April 9, 2019, from 2-6 PM at Uecker-Witt Funeral Home, 524 N. Park Ave, Fond du Lac, WI, 54935. A funeral service will follow the visitation at the funeral home at 6:00 PM. Cremation has taken place. To send flowers or a remembrance gift to the family of Gregory A. Strean, please visit our Tribute Store. "Email Address" would like to share the life celebration of Gregory A. Strean. Click on the "link" to go to share a favorite memory or leave a condolence message for the family.